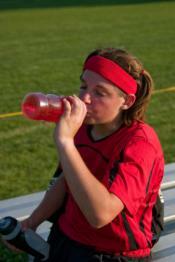 Verbal encouragement from parents and coaches to drink fluids before, during, and after practice is important. 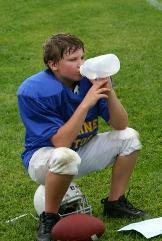 Remind your child to drink fluids before practice, and then again after practice to replace fluids lost during sports. Ask questions and take other steps to determine your child's hydration status and how much fluid he needs to drink to fully rehydrate. When you are watching your favorite sports team on TV, have you ever noticed that the first thing the athletes do when they get to the sideline or dugout is get a drink? Whether on their own or from the hand of a trainer, they drink constantly every chance they get throughout the game. That is how important hydration is to athletic performance. Proper hydration is just as important to athletic performance as the food your child eats, and more important to his safety. An athlete who becomes dehydrated is at risk of a heat illness, among the most dangerous sports injuries, as well as the most preventable. 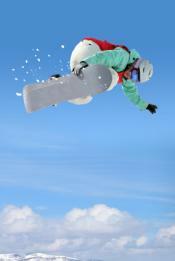 To find information on a sports hydration topic, click on a topic in which you are interested. You will be sent to a list of articles, videos and blogs on that topic. If you are unable to find the sports hydration information you are looking for on the topics page, please e mail us your request or pose the question to the MomsTeam community of parents and experts (of which you are an important part) by clicking on the Forums tab at the top of the page, finding a forum in which to ask your question or start a new discussion thread. Together, we can go a long way towards making sure youth athletes are properly hydrated and to eliminating heat illnesses in youth sports. Can Education Improve A Youth Athletes' Hydration Status? If you want your youth athlete to arrive at practices and games well-hydrated, and to maintain that status during and after sports, it stands to reason that educating them about the benefits of proper hydration could make a difference? But does it? MomsTEAM's hydration expert says the studies suggest that education alone doesn't work.